Samsung has launched a new smartphone which features a slider design and triple auto-rotating camera array. The new Samsung Galaxy A80 design facilitates an expansive all-screen appearance without notches or cutouts. Overall this is just one of the attractive features of this premium-midrange smartphone. 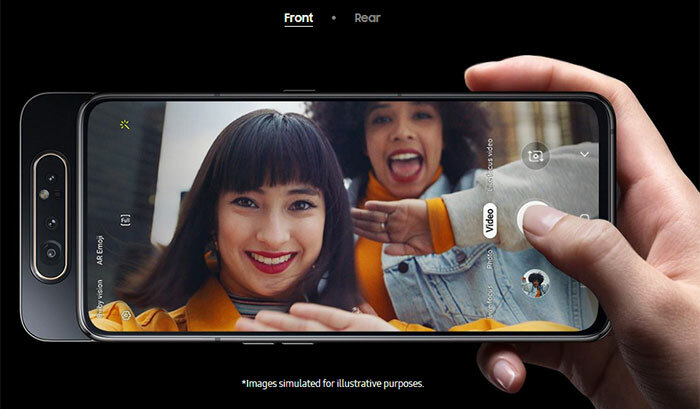 With regard to the star attraction of this smartphone, the auto-rotating camera and slider design, Samsung says it was inspired by the 'Era of Live' an evolution from the 'Era of the Selfie'. It goes on to explain this is a trend in people who increasingly use their smartphone for sharing live interactions - and the high quality rotating camera facilitates users sharing the world around them. As you slide the mechanism open, the smartphone's camera auto-rotates to face you. 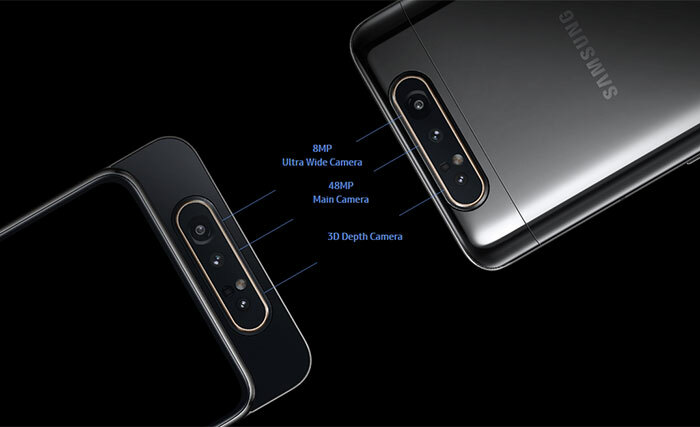 There are three lenses in the A80's rotating array; a 48MP f/2.0 main camera, an 8MP f/2.2 ultra-wide (123°) camera, and a 3D depth camera. Camera hardware is aided by advanced processing and software which facilitates super steady video, and optimised scenes (30 types recognised), and more features and effects. The impressive camera array is complemented by Samsung's 'New Infinity Display'. 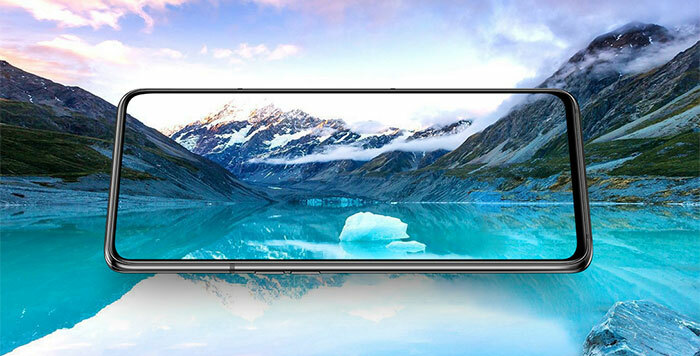 This minimal bezel screen is of the AMOLED type and has a diagonal of 6.7-inches. An in-screen fingerprint reader is present. Samsung's choice of screen is an FHD+ model, which is 1080 x 2400 pixels to be precise. For a 6.7-incher the handset is pleasingly compact at 165.2 x 76.5 x 9.3mm. 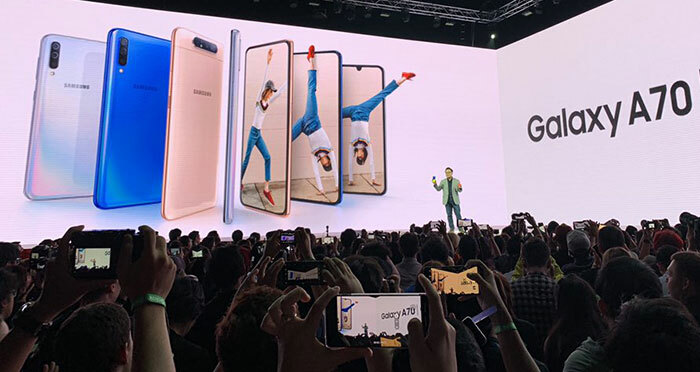 On the topic of physical characteristics, Samsung says the Galaxy A80's smooth curves are designed for ease of use and holding comfortably for long periods. Inside you will find an Octa Core (2.2GHz Dual + 1.8GHz Hexa) processor, 8GB of RAM, plus 128GB of storage. Samsung has fitted a generous 3,700mAh battery that supports fast charging at 25W. On the software side Android 9 Pie comes pre-installed and Bixby (with button or voice summoning) is there for your convenience too. The Samsung Galaxy A80 will become available in Phantom Black, Angel Gold with pink reflections, Ghost white with blue reflections. It will become available from 29th May but pricing is yet to be revealed. Samsung also launched the more conventional teardrop-notched Galaxy A70, which will become available from 26th April. You can check out infographics which nicely sum up both the A70 and A80 here.